View More In Signal Boosters. 1.The frequency is the most important thing to choose a signal booster, because the GSM, 3G or 4G means different frequency in different countries. You might check your frequency at the website of http://www.unlockonline.com/mobilenetworks.php, but it is only for your reference. 2.The main unit would get warm after it has been worked for 30 minutes. If it does not get hot, please send emails to us. 3.If there is still no signal after you install the booster, please adjust the outdoor antenna. You should get 2-3 bars of stable signal in the location where the outdoor antenna is fixed in, or the booster can't work. Outdoor antenna should be installed 2 meters higher of your roof or put it on a high open place, so it can get better reception. 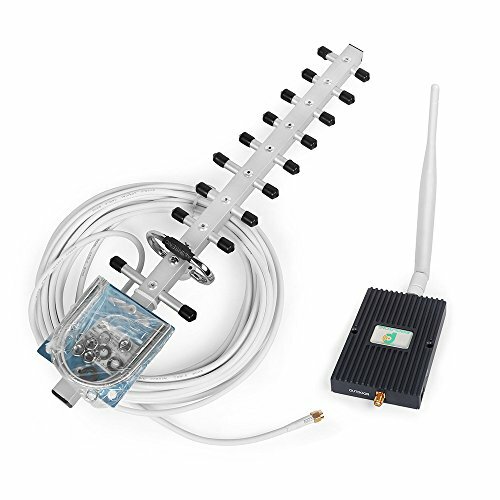 4.If you can get full bars signal after you install the booster, but can't make calls, please make sure that Outdoor and Indoor antenna are seperated by wall to avoid interferrence, putting them as far as 10 meters. WARNING: This is NOT a CONSUMER device. It is designed for installation by FCC LICENSEES and QUALIFIED INSTALLERS. you must have an FCC LICENSE or express consent of an FCC licensee to operate the device. Unauthorized use may result in significant forfeiture penalites,including penalties in excess of $100,000 for each continuing violation. EXCELLENT FUNCTION: Boost GSM W-CDMA band 2 cell signal to make call and send txt .Reduces dropped call, better voice quality. You could share you enjoy time the via good voice call when you long-distance travel and you don't worry about the call will dropped suddenly. WORKS WITH ALL CARRIERS IN THE UNITED STATES : AT&T, T-Mobile, Verizon, Straight Talk, and U.S. Cellular. No matter what carrier you use, it is guaranteed to increase the signal strength of any cellular device, giving you crystal clear calls. LARGE COVERAGE: Large coverage, up to 2500sqft,supports 50 simultaneous users,No more dropped calls good for home or office, no more dropped call again. The booster simply amplifies your existing signal to give you more bars and maintain fast data speeds while you browse the internet or talk on the phone. EASY TO INSTALL: All of the components you need for installation are included in the package with easy to read, step-by-step instructions. Requires no technical experience with easy plug-and-play style setup, safe and convenient to use. GUARANTEE: 30 days customers satisfaction,3 months free replacement,1 years manufacturer warranty..Providing you with the friendliest customer service.Any problem, please kindly contact us. If you have any questions about this product by PROUTONE, contact us by completing and submitting the form below. If you are looking for a specif part number, please include it with your message. Wilson 901132 Vehicle Mount "Prod. Type: Telecommunications/Accessories"